A land of sun that beats down on desert sands against the Atlantic shores; a land of people who have survived for centuries in the world’s harshest environment, Western Sahara is Africa’s last colony, brutally occupied by Morocco since 1975 when Spain abandoned its colony of 70 years. 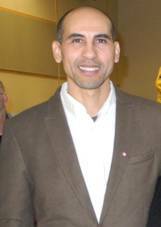 Recently Victorians had the opportunity to meet and hear Ray Mesoud Burhi, the representative of the government-in-exile of Western Sahara; he would be the ambassador to Canada of the Saharawi Arab Democratic Republic (SADR) if Canada recognized it as a nation as more than 50 other countries do. Speaking in Victoria, Burhi explained the historical context for the right of nationhood for the Saharawi people. Since it was occupied by the Spanish in 1884 and by Morocco since 1975, Saharawi, the people of Western Sahara, have been fighting and working for their independence and self-determination for their resource-rich nation situated between Morocco, Mauritania and Algeria. 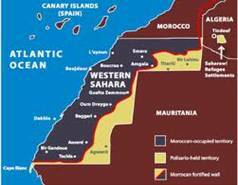 An armed struggle with Morocco after its occupation of most of Western Sahara ended in 1991. Almost half the civilian population fled from the Moroccan military and live in refugee camps, now communities, in Algeria. Promises for referendums have been broken and the world either ignores the illegal and unjust situation or collaborates with Morocco, a well-supported ally of the USA. Burhi’s family with him as a small child fled across the desert persued by the Moroccan airforce dropping napalm and phospohorus bombs on the unarmed refugees. Burhi still makes his home in the refugee camp near Tindouf, Algeria. There is international and Canadian interest in the mineral deposits of Western Sahara where Spanish companies began the exploitation of rich phosphate deposits that continues to this day, now by Moroccans. These deposits and the potential for other minerals along with the rich off-shore fishery are the main reason for Morocco’s militarized occupation. Canada is negotiating a Free Trade Agreement with Morocco; Saskatchewan Potash Corporation buys phosphates from Morocco which originate in Western Sahara mined by a company wholly owned by the Morocco government. In spite of UN recommendations and promises of referendums, Morocco still rules Western Sahara. The portion of the state along the Atlantic coast has received so many Moroccan migrants that they now outnumber the Saharawis who are constantly subjected to surveillance, harassment and detention which may result in torture and lengthy jail sentences. Resolutions #242 & #338 of the UN Security Council include statements that prohibit permanent settlement of occupied lands for domestic or commercial purposes; resolutions that Canada professes to respect. International law also recognizes the rights of colonized peoples as in the case of East Timor. The Fourth Geneva Convention prohibits (and makes criminal) settlement of a population into the occupied lands of others. A narrow strip to the east and south is a “liberated zone” with little development and few people; this strip is separated from Morocco and the western region of the state by a more than 2000 km long earth wall liberally planted with 5 million landmines. Burhi said that anyone can visit the liberated zone and camps to learn about the situation of Western Sahara; its government with more than 55% women MPs is located in the Tindouf camps. Schools, hospitals, services and distribution of humanitarian aid are organized by the government. The Moroccan government does not allow any journalists or human rights workers to visit the occupied territory of Western Sahara. Recently both BBC and USA mainstream media have been featuring stories on Western Sahara, including the massive human rights abuses of the Saharawi people there. In a recent judgement of the Moroccan Court twenty-four Saharawi were sentenced to life to 20 years in prison after a peaceful protest camp was destroyed. The military trial of these civilian prisoners, according to Amnesty International, does not meet recognized international standards for a fair trial; it reports the trial was flawed from the outset. The sentences are long and harsh. All these Saharawi say they have been tortured, and sexually abused to give forced confessions. A number of European governments, including Norway, the Netherlands and Switzerland have policies about Western Sahara; some refuse to buy products from the occupied countries, several stopped a European fishing agreement with Morocco and others have divested their pension funds from companies, including Potash Corp, involved in the occupation. When we Canadians buy mineral fertilizer for our gardens we are supporting this illegal occupation, fertilizers contain phosphate from Western Sahara. The Canada Pension Plan invests in Potash Corp and shows no inclination, so far, to divest. Even the USA is concerned and like Europe has negotiated a Free Trade Agreement with Morocco that excludes Western Sahara. Burhi hopes that Canadian will raise awareness about this issue as Canada negotiates its new trade agreement with Morocco. While in Victoria, Burhi met with MPs Randall Garrison and Murray Rankin who committed to taking up this issue with Ed Fast, Minister of International Trade, and also to arrange meetings in Ottawa for Burhi with Paul Dewar, MP foreign affairs critic. While there is much we can do as individuals, a new Western Sahara solidarity group is being organized in Victoria. Details of immediate and important actions follow. Room S-3800, Secretariat Building, United Nations, New York, NY 10017, USA, on behalf of the twenty-four Saharawi Prisoners of Conscience after a protest camp at Gdeim Izik was destroyed. The trial of these civilian prisoners, according to Amnesty International, does not meet recognized international standards for a fair trial; it reports the trial was flawed from the outset. The sentences are long and harsh and for a UN mechanism to monitor and report on human rights in Western Sahara under the occupation of Morocco, equivalent to other UN peacekeeping missions worldwide that includes regular monitoring and reporting of human rights violations. photo: Musicians perform in Algerian camp by Stefan Suess, Berne, Suisse. PLEASE WRITE TO: Chad Ulansky, President & CEO, Metalex Ventures Ltd., 203 – 1634 Harvey Avenue Kelowna, BC, V1Y 6G2 and ask that his company relinquishes its exploration permits in Western Sahara, granted by Morocco, until the legitimate government of the SADR is re-instated.